Some of the best things come in fours. Right off the top of my head I think of a four leaf clover, said to be lucky if you find it. There are four seasons, four directions, four suits in a deck of playing cards. I’m sure there are others, but one especially exciting foursome is of the fantastic variety. 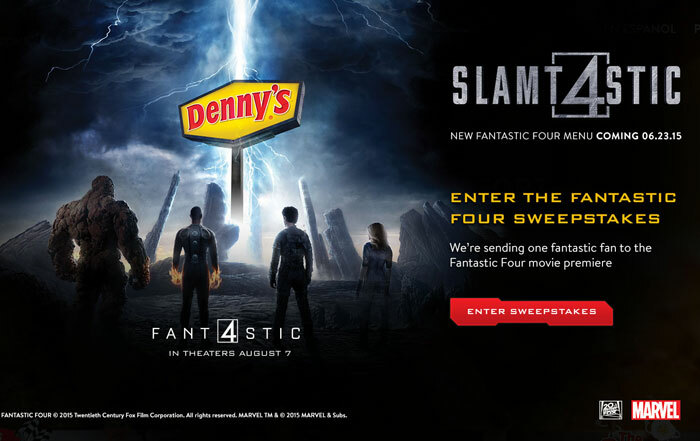 Fantastic Four will hit theaters August 7th and Denny’s is pleased to announce they have partnered with 20th Century Fox to bring the adventure to their iconic family diner. As the official restaurant partner of the new movie, guests can expect action-packed fair inspired by Marvel’s first family of superheroes. For those of you that don’t know, the Fantastic Four is a re-imagining of one of the longest running super-hero teams. It centers of four young outsiders that much work together after being teleported to an alternate and dangerous universe. While they’re there, they are altered in the form of shocking new abilities which throws their lives upside down. They struggle as they learn how to live and control their new abilities while saving Earth from a former ally turned enemy. The film stars Miles Teller, Michael B. Jordan, Kate Mara, Jamie Bell, Toby Kebbell, Reg E. Cathey, and Tim Blake Nelson. Josh Trank directed from a screenplay by Jeremy Slater and Simon Kinberg and Josh Trank, based on the Marvel Comic Book by Stan Lee and Jack Kirby. The Sizzling Human Torch Skillet: Includes two eggs, potatoes, bell peppers, onion, jalapenos, pico de gallo, pepper sauce and cheese. The Thing Burger: Includes a beef patty topped with hash browns and an egg, served with fries. The Fantastic Four-Cheese Omelet: Includes three eggs and cheddar, Swiss, mozzarella, and Parmesan cheeses, sun-dried tomatoes, spinach, bacon, mushrooms and onions; served with hash browns and choice of bread. The Invisible Woman Slam®: Includes two blueberry pancakes topped with strawberries and banana; served with two eggs, bacon or sausage, and hash browns. Other new menu items are the Dr. Doom lava cake and even smoothies! 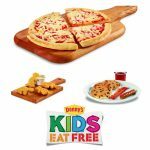 Denny’s will be airing dedicated TV spots starting the week of July 6th as well as posting exclusive clips to their Instagram channel. Of course, the Denny’s diner gang “The Grand Slams” web series are joining in on the fun with super-hero inspired makeovers in Fantastic Four episodes starting July 1st. 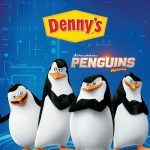 In addition to the new menu items and other tie-ins, Denny’s is offering one lucky fan the chance to win a trip to the movie’s premiere on August 4th! Head over to www.dennysfantastic4.com for details! 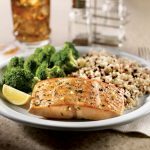 Do you have a favorite Denny’s menu item? Denny’s is looking better now more then before, love that they upgraded there menu a while ago, and the invisible woman slam looks good. I haven’t been to a Denny’s in years. Too bad there isn’t one near me in GA. The food looks delicious! 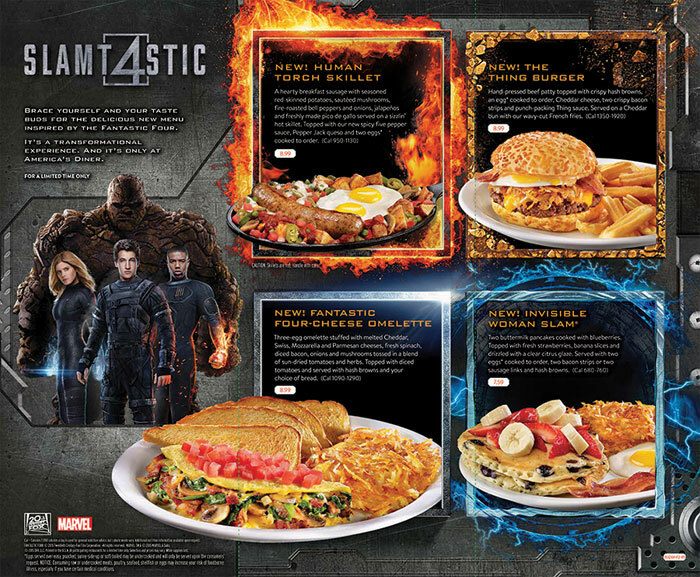 I want to try The Fantastic Four-Cheese Omelet. I like Denny’s omelets. This is too cool! Look at that food! We actually love Denny’s and go there a lot! 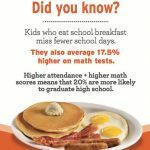 I haven’t been to a Denny’s since I was a kid, but I sure wish I had one near. They had wonderful food for the whole family. I can remember getting a Rootie Tootie Fresh & Fruity. Now I’m really hungry for Denny’s. 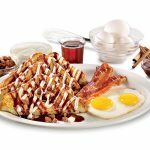 We are huge fans of Denny’s but had no idea they were getting new menu items! These look and sound amazing! I’m a huge fan of dessert so I’ll have to try them! I would love if we had a Denny’s here, the food looks delicious. 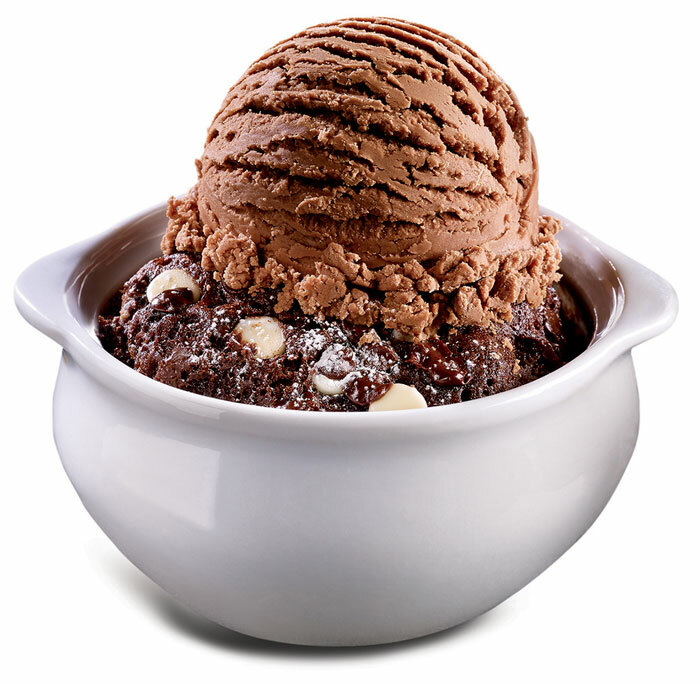 That Dr. Doom lava cake looks dangerous.